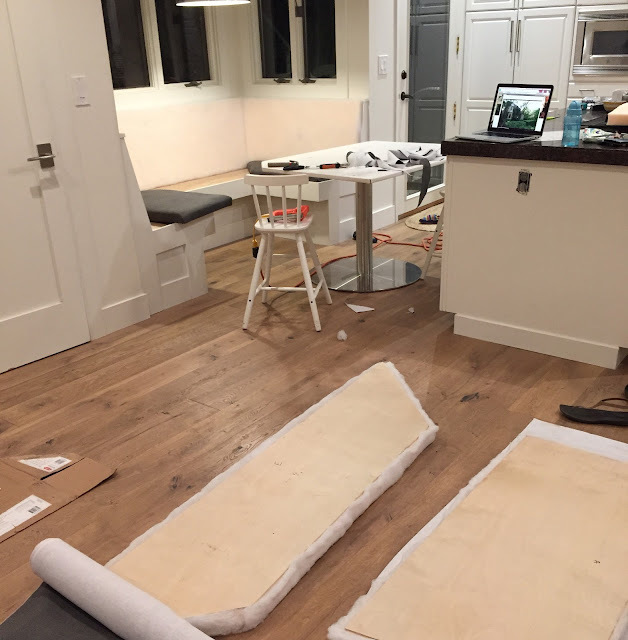 project: haus: Day 12: Nook cushions done! 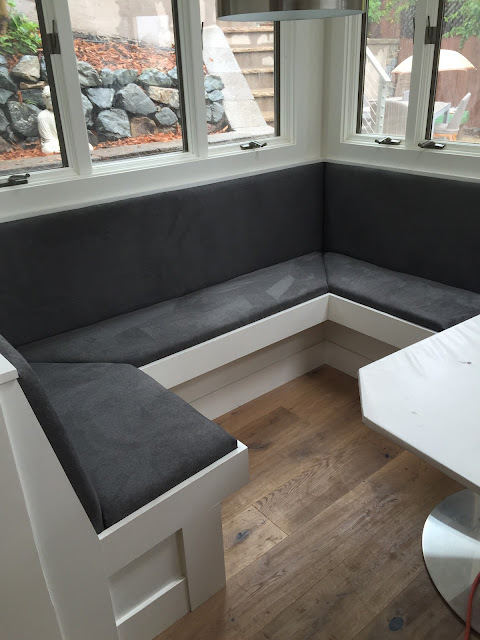 Day 12: Nook cushions done! One of the first things we did when we bought our house was to give the kitchen a facelift. 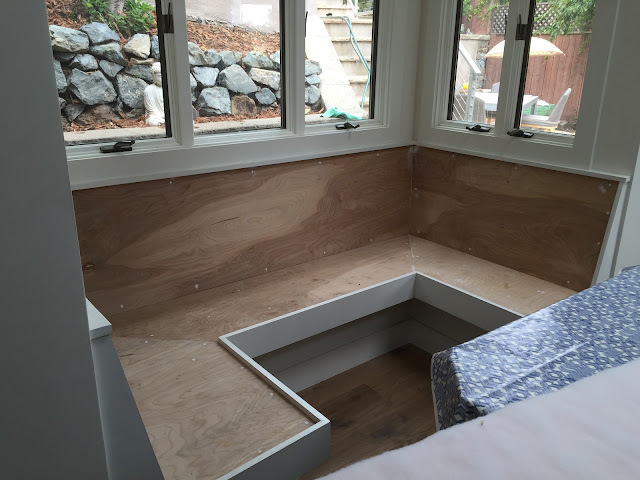 That included the breakfast nook. With some paint, new upholstery and a new pendant light, it looked like new. And then construction happened. And when we uncovered it the cushions were moldy and dirty and beyond repair. So I could have just reupholstered them. Or we could just have the whole thing rebuilt. Which is what we did. Because at the end of the day, we eat 8 out of 10 meals here and the benches were just not very comfortable. And food and dust collected underneath. We made some "simple" changes and ended up rebuilding the whole damn thing. And this is how it looked for weeks. And the reason it looked like this is because I got a proposal for $2500 to create the new cushions and that basically stopped me in my tracks. I would have to go the DIY route. 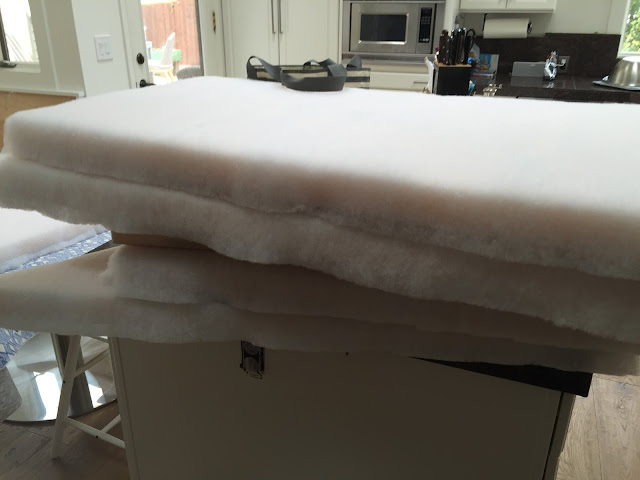 It took several trips to the Foam Factory in Berkeley but after some testing and cutting and testing somewhere, we picked 2" foam plus batting. 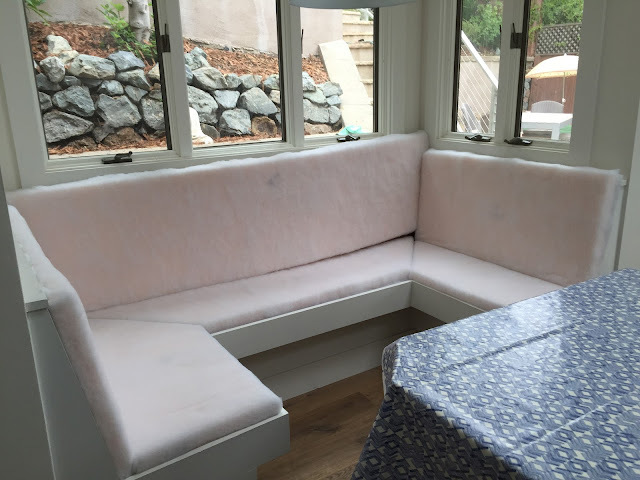 I took them the plywood templates and then created these pink fluffy cushions you see here. And then on Saturday night, after all were asleep, I started with the upholstering. And about an hour into it, I started to curse this DIY project and saving money and the nook and the whole damn project. It's a slippery slope when that happens. I finished the 3 base pillows and one back pillow and went to bed unhappy with the results. And for all of Sunday, it just sat there, unfinished. And I was unhappy and dissatisfied and utterly frustrated. My husband chimed in with the advice that saved the day: " Here's the thing. Just finish it. It looks pretty good. Let's live with it for a month and then if you still really really hate it then we can figure out if we need to fix it or have it done professionally." Ok, I could live with that. Just need a new table top now and the nook will be ready to go!